Many primary schools could be "handicapping" pupils by not devoting enough time and effort to teaching handwriting, a study suggests. More than half of the teachers interviewed at 39 schools in south-east England said they had not received enough training in the area. London University's Institute of Education also found most schools did not work on improving writing speeds. But a government spokesman said "clear, well-paced objectives" were in place. However, a quarter had one without the other. Two-thirds of teachers had not been shown how to teach handwriting during their initial training. Less than half of schools set aside time for practice. Only a fifth of those with handwriting policies taught children ways of increasing their speed, which could affect their future performance in exams. Schools had "very limited awareness" of the needs of pupils used to writing in a different script, with only one in four catering for these. Researcher Rhona Stainthorp said: "Unless children learn to write legibly and at speed, their educational achievements may be reduced and their self-esteem affected. "Handwriting is an essential skill for everyone, even in this age of computer technology." 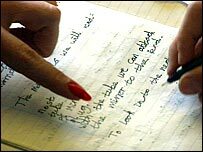 A Department for Education and Skills spokesman said the national curriculum stated that all pupils "should be taught key handwriting skills that enable children to write fluently and legibly". He added: "We support schools in meeting these requirements through the primary national strategy, which provides clear, well-paced objectives on developing handwriting and the correct formation of letters. "Schools can also consult experts in their local authorities to help them develop effective approaches to teaching handwriting."